Fixed to work properly on Windows 10. 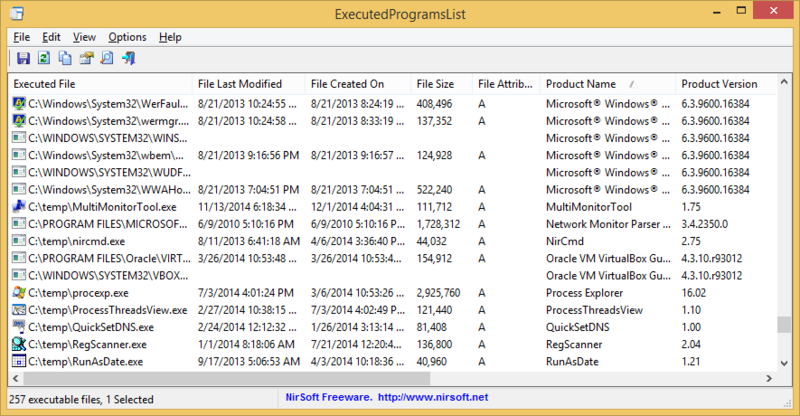 After running ExecutedProgramsList, the main window displays a list of programs and batch files that you previously executed on your system. You can select one or more items, and then export them to comma-delimited/tab-delimited/html/xml file using the 'Save Selected Items' option (Ctrl+S) or copy them to the clipboard (CTRL+C) and then paste them to Excel or any other spreadsheet application. /stext <Filename> Save the list of executed programs into a regular text file. /stab <Filename> Save the list of executed programs into a tab-delimited text file. /scomma <Filename> Save the list of executed programs into a comma-delimited text file (csv). /stabular <Filename> Save the list of executed programs into a tabular text file. /shtml <Filename> Save the list of executed programs into HTML file (Horizontal). /sverhtml <Filename> Save the list of executed programs into HTML file (Vertical). /sxml <Filename> Save the list of executed programs into XML file. A file named ExecutedProgramsList_lng.ini will be created in the folder of ExecutedProgramsList utility. After you finish the translation, Run ExecutedProgramsList, and all translated strings will be loaded from the language file. If you want to run ExecutedProgramsList without the translation, simply rename the language file, or move it to another folder. ExecutedProgramsList is also available in other languages. In order to change the language of ExecutedProgramsList, download the appropriate language zip file, extract the 'executedprogramslist_lng.ini', and put it in the same folder that you Installed ExecutedProgramsList utility.